Join us at Ivory Jack’s for burgers, brews, and some Goldstream-themed silent auction items! Your purchases (including special food and drink items!) will support the work we do to conserve lands in the Interior. Come on out, place a bid or two, and eat a burger for your favorite bog! The Interior Alaska Land Trust invites you to the Ken Kunkel for a Goldstream Community Meeting. We want to hear more about what you’d like to see in the Goldstream Valley greenbelt and tell you a bit about our efforts to protect the trails and open space you love. Refreshments will be provided. After Ken Kunkel, we’ll head to the Peat Ponds for a guided tour on *BRAND NEW* winter trails to a new parcel we’re working to conserve. Skiing, snowshoeing, and walking are all welcome! 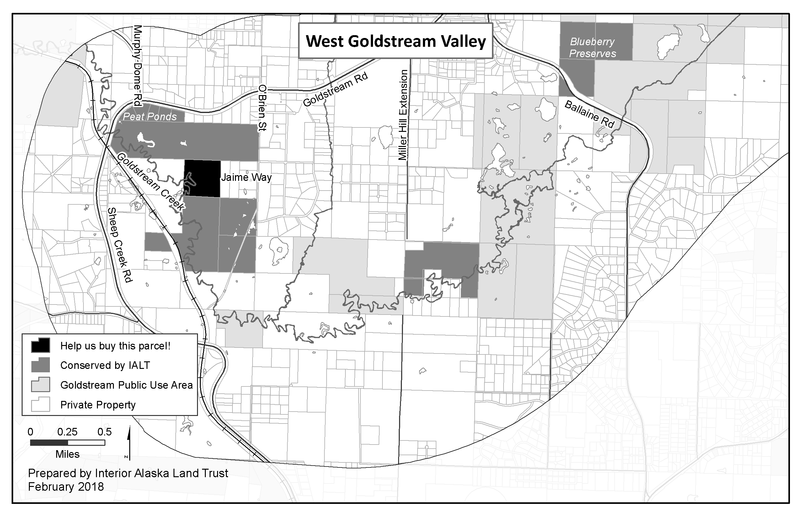 We’re currently raising funds to purchase a parcel south of the Peat Ponds that connects two large sections of the Goldstream Greenbelt (see map posted below)!